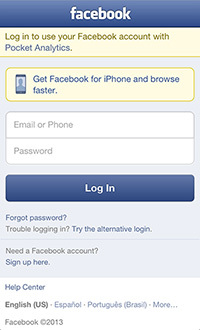 Enter your email and password, and tap "Log In". You will then be asked to Name New Device - you can enter whatever you like, but something meaningful (like "Pocket Analytics App") would probably avoid confusion in the future. 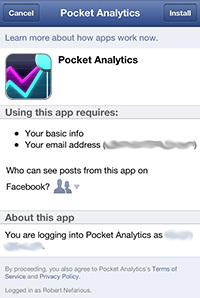 Next, Facebook will confirm that you want to install the Pocket Analytics- i.e. that you want to grant Pocket Analytics access to your basic user info. Tap "Install" at the top right of the page. 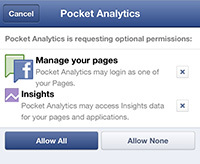 Finally, Facebook will ask you to grant Pocket Analytics some additional permissions. These are to "Manage your pages", and "Insights". Note that we really DO NOT want to manage your pages, but requesting this permission is the only way to grab insights for your pages. We will only ever access Facebook in a read-only fashion. Tap "Allow All", and that's it! 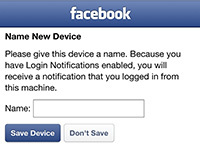 All communication with the Facebook API is encrypted using https.